If you've visited before, refresh for updates~! 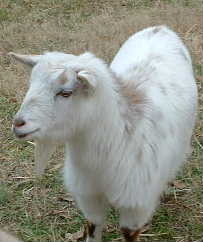 I am owned by cats, a super dog and great goats. My name is Bobbie, so much for 'about me', now let me introduce you to The Bunch! Mr. Nicholas was here first. she had just gotten to replace a cat killed by a car. She was going to take him to the pound. Didn't take me long to get to her back door. He was quiet a mess! He turned into one of the Best Cats Ever! This website is dedicated to him. 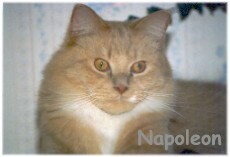 to take this sweet cat that I love so. 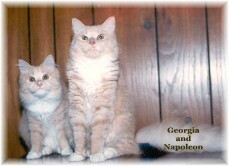 Napoleon and Georgia came by way of my son. He came in the house with two tiny orange tabbies. Just for a while, Momma 'till I can find them a home, OK? Again my heart breaks. 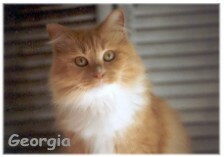 I lost Georgia to cancer on April 30, 2007. 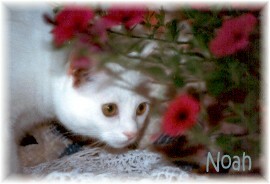 In 1994, driving in an area near my home, I saw a small black and white kitten in the street. I'd seen several cats in the nearby yard, and two had been run over. It didn't take me long to decide he'd be better off with me! 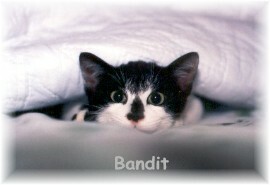 Meet The Bandit. .
My crazy cat, my cow kitty, my beautiful Bandit left for The Bridge on June 3, 2009.
and know it will be just a blink of the eye until we meet agan. Leaving Walmart one nice day in 1995, I noticed a man and boy sitting by a box in front of the store. Trying hard to not look, I looked in the box and saw two tiny kittens. 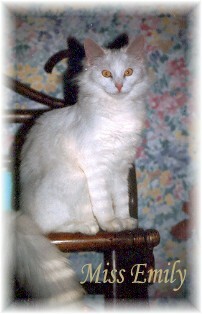 One pure white longhair and a very small gorgeous calico. 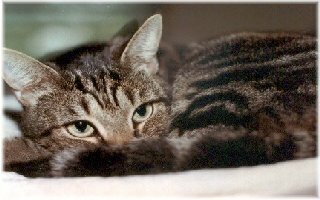 My dear Daddy called one cold and wet day in '96 to ask me what to do about a kitten in a tree at his house. Well, what else was there to do but go get her out of the tree, and take her to Animal Control? 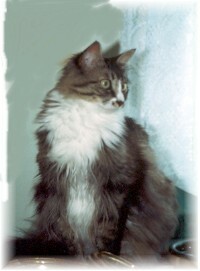 She was a long hair black/brown tabby, with a beautiful white chest. It took three days and two ladders to get her out of that tree. Here's Maggie Mae - Click her to see more pictures! Oh, yes, Noah. I'm just keeping this kitten for a couple of weeks for my niece! Let’s see…I think it was in late 1996 that he came to live with us for those couple of weeks. He is a 20 pound white short hair that loves to be loved. 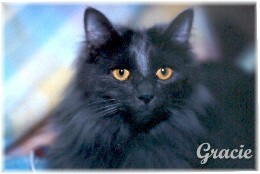 The next feline to join The Bunch was That Gracie! 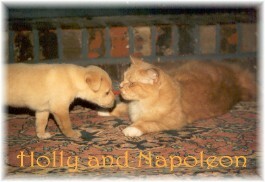 She and her littermate were born in a warehouse environment in September 2000. Something got her litter mate, and I went and got Gracie. She was about five weeks old and in pretty bad shape. A trip to the vet and some loving care and in a few weeks she was in top form. someone asked if I would take a grown house cat that had been kicked out of his house after a divorce. They said he'd been living on the streets, was very matted, in bad shape. Click Timothy for more pictures! You just know when the phone rings early in the morning that something is wrong. What was wrong this time? A little kitten had been thrown out and made it's way to a womans house. He asked if I'd come get it. A starving purr machine in spite of it all! 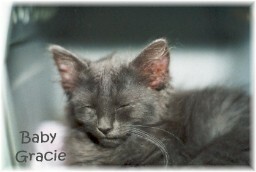 Click her picture to read about her SPAY DAY! We have not updated in so long! To catch up with the latest please visit our blog! Do you let your cat go outside? "We Buried Your Cat Today"
Just click on the Inside Cat tab. 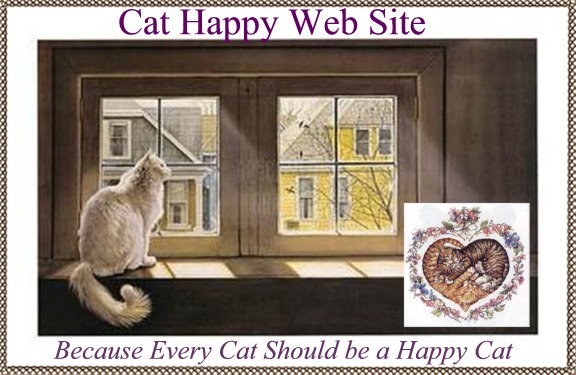 cards, cat information, web site designs, and much, much more! 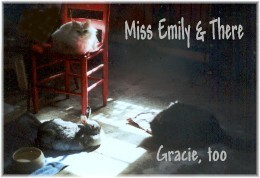 Oh, by the way, she has lots of CATS!! Click the link above to her wonderful Cathouse!! 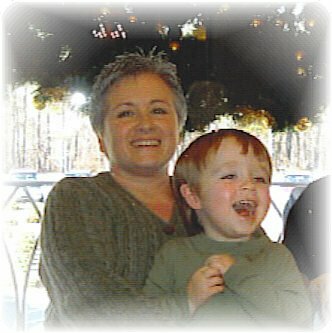 I've made her a small memorial page right now it's all I can bear to think about. 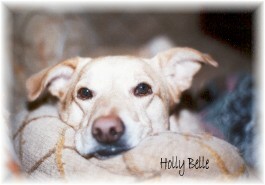 My sweet dog is Holly Belle. I picked her out of a litter of 20 puppies. She was a runt and in very poor condition. 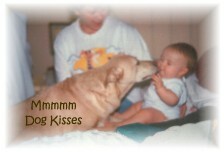 Holly Belle loves my wonderful grandson, Benjamin Dean Jackson. She is the Official Greeter at this house. Click on the picture below to see more of Holly Belle Asbell! My first rabbit is named There as in 'Hello, There' 'cause it's the first thing I said to her. She lived in a very small pen on concrete year round. I asked for, and thankfully got her. She's been my little house rabbit since 1998. My second little rabbit is TeeToo. Someone gave him to my 17 month old grand niece in 2001.
just a little white and brown baby rabbit in a little box. The first thing I said to him was 'Hello, There' but certainly could not name him There, too. So we settled on the next best name, TeeToo. Enjoy those fields and flowers..
That Gracies' friend, There, has joined TeeToo at The Bridge. She had been ill for a short time. On Sunday night before Labor Day, 2005, I gave her medicine. She was cool, I knew she was dying and I held her as her sweet gentle spirit left. Godspeed, There. We will miss you so, until we meet again. When you adopt me my life is likely to last only 15 to 20 years. Don't forsake me, any separation from you is painful. Give me time to understand what it is you want from me. Change can be more difficult for me than for you. Don't be angry with me for a long time, and don't lock me up alone as punishment. You have your human family, your friends, your entertainment and I only have you. Trust me and help me to trust you, it is crucial for mine as well as your well being. Talk to me . . . even if you think I don't understand your words. I understand your voice and love when you speak to me and stroke me. but I choose not to bite and scratch you because I love you. Be aware, that however you treat me, I will never forget. Before you scold me, ask yourself if something is wrong. Perhaps I am sick, or just plain tired, frustrated and weak. Try to understand what it’s like to be me, put yourself in my place. Take care of me when I get old and don't abandon me, for you, too, will grow old. Notice when I am ill, when I need you to take me to the vet for help, just as you need to see a doctor. Go with me on the most difficult journeys. "I can't bear to watch"
"Do it when I leave"
I need you with me even at the end of my journey. because I love you and trust that you will. While at a goat show at the Olympic Horse Park I saw the smallest goat I'd ever seen, smaller than That Gracie! In May of 2001, two Nigerian Dwarfs became part of The Bunch. Oh! 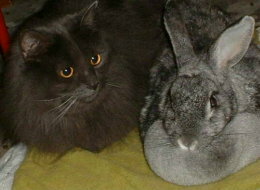 In addition to my furkids, I have human ones, too! There are a few more pictures of The Bunch.. When a man wantonly destroys one of the works of man,we call him a vandal. When he destroys one of the works of God, we call him a sportsman. If you are planning to have this done, take a few minutes to read this.. Click the small box directly below, or the bandaged paws of the cat. I'm honored to have received The Cody Award! 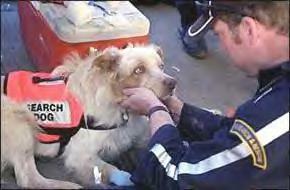 Pictured is 'Porkchop', he is one of the many Furry Heros that helped after 911. The website has been taken down, but I want to leave this fine animal on my site. What an adventure it is to visit Cat Happy! 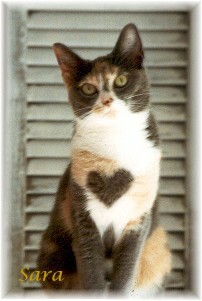 From Cats and Dogs and Hummingbirds to Horses and other furs between! Here's Stormy Lee! He's a very interesting cat with his statue. Be sure to see the vintage photos on this site! Pay Laura, in Alaska, a visit. She lives with MANY cats! Andiesisle is one of the most inspirational sites I've ever visited! 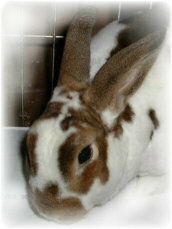 Visit Cornwall's Voice for Animals. Read the latest animal news, learn how to help protect them. You'll find the best cathouse on the 'net here. Click banner to visit lisaviolet. You can feed an animal for free! 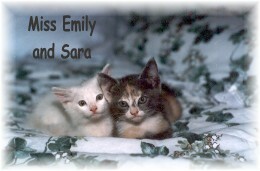 All it takes is a click on the ANIMAL RESCUE SITE Logo below. I thank you so much! The animals Thank You Very Much! Come back again! 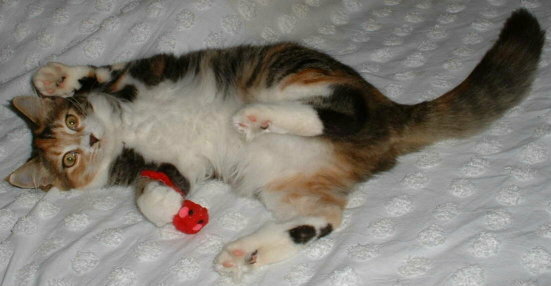 I have a blog with, of course, more cat pictures!